As an alternative to the facet search, you can also view all biosamples in one of our biosample partition grids. We have two different biosample partition grids available: Biofluid vs Condition and Biofluid vs Assay Type. First, you can click Select Profiles in the navigation bar and then click Biofluid vs Condition Grid or Biofluid vs Assay Type Grid. Each cell in this grid indicates the total number of biosamples collected and profiled for exRNAs from a biofluid-condition combination. If you click the number in a given cell, you will be able to see key metadata about all the biosamples that meet the biofluid-condition criteria given for that cell. The Biofluid vs. Assay Type grid is very similar except its columns are assay types instead of conditions. Once you click the number in a given cell, a new grid will be displayed that contains information about associated samples. of each biosample (Condition, Anatomical Location, Biofluid Name, and exRNA Source). The grid will display ERCC quality standard metrics for each sample. The "Meets Standards?" column will clearly indicate whether the sample meets the required quality thresholds: "YES", "NO", or "NA". A value of "NA" indicates that we are currently reevaluating that sample's quality. You can view the ERC Consortium QC Standards page to learn more about the QC standards used. For all profiles, click the icon to download the "core processed results" associated with the sample. For RNA-seq profiles, this download will be the exceRpt processed core results archive. This archive will contain mapped read counts from all three stages of exceRpt (endogenous, exogenous miRNA and rRNA, and exogenous genomes). For qPCR profiles, this download will be the qPCR Targets file. The file will contain different miRNA targets and associated Ct values for those targets. 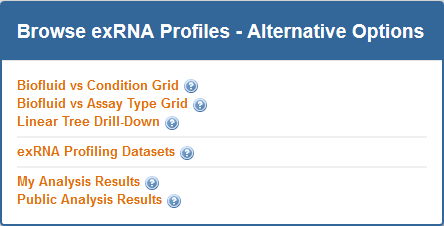 For RNA-seq profiles, click the icon to download the full results (alignments) for the first two stages of exceRpt (endogenous alignment and exogenous miRNA and rRNA alignment). For RNA-seq profiles, click the icon to download the original FASTQ source file. If you see , this icon means that the data is restricted access and is currently under the protected period (embargo). The embargo on this dataset will end 12 months after the time the data was submitted to the DCC. View the ERC Consortium Data Access Policy for more details. If you see , this icon means that the data is deposited (or will be soon) into a controlled access archive like dbGaP. You can click the icon under the Actions column to view any available links to controlled access archive(s) that contain data for the relevant biosample. You can then request access through those external databases. For RNA-seq profiles, click the icon to download the taxonomy tree (either exogenous ribosomal RNA or exogenous genomic reads) created by exceRpt. For RNA-seq profiles, click the icon to download the full results (alignments) for the third stage of exceRpt (exogenous genomic alignment). Click the icon to download the biosample metadata document associated with the biosample. You can also view the document in GenboreeKB (our UI for viewing metadata) by clicking the biosample's accession ID in the Biosample Metadata Accession column. Click the icon to download the experiment metadata document associated with the biosample. Click the icon to download the donor metadata document associated with the biosample. Click the icon to view a histogram of read counts mapped to various libraries. Click the icon to view information about external databases associated with the biosample. If the biosample can be found in any external databases (SRA, dbGaP, GEO, etc. ), then a link is provided. If the biosample is still embargoed, then information about the embargo period is displayed, along with a link to the ERCC data access policy. There are three additional buttons at the top of the grid. First, the Back to Home Page button will take you back to the exRNA Atlas landing page. Second, the Download All Samples button will allow you to download result files in bulk. To learn more about this option, view this tutorial. present in the Genboree Workbench. To learn more about this option, view this tutorial.